I received many inquiries about Van de Graaff generator and other related machines in these few years of time. They are asking the difference between PYRO-ENERGEN and Van de Graaff generator and if they can use it for healing just like that of PYRO-ENERGEN. Other questions were about lightning and its benefit for living, because I mentioned about it in the website. Here, you will know all of them. First, what static electricity really is? You walk across the rug, reach for the doorknob and.ZAP! You get a shock. Or, you come inside from the cold, pull off your hat and.ZAP! All your hair stands on end. What is going on here and why does it happen so often? Some types of static electricity are harmful and some are beneficial and useful to living things. The PYRO-ENERGEN, Van de Graaff generator, and lightning are all in the category of electrostatic mechanism. Van de Graaff generator is a mechanical static electricity generator which can produce several thousands of high voltage to make your hair stand when you are near the machine. Van de Graaff generator is used for experimentation in Physics as well as other societies. All of us were benefited from this invention although many do not know its effect to humans. Some people who have their own Van de Graaff generator ask if they can use it for treating viral diseases like that of PYRO-ENERGEN. Yes, you can use it by just standing near the machine making your hair stand. However, please note that Van de Graaff generator you have may be producing only positive static current, instead of negative power (PYRO-ENERGEN produces negative static electricity). Our clinical tests show that the blood pH of animals under the positive high-tension voltage for a long duration turns acidic which makes animals as well as other living things unhealthy. Some people start feeling dizzy, then vomits. Others may reduce their appetite. However, the blood pH of animals will have high alkalinity when exposed to negative high-tension voltage, and even the plants grow healthy. Clinically, science agrees that a healthy body have slightly high blood pH alkalinity. Lightning is a powerful natural electrostatic discharge produced during thunderstoms. Friction of positively charged cloud and negatively charged clouds produce lightning. Most lightning strike we see are negatively charged. It is very seldom that there are positively charged lightning strike. Lightning has a mystical side, too. Some people reported that they miraculously survived when they were hit by lightning, but when they woke up, their former incurable diseases were gone. In Japan, rice farmers praise God when lightning occur often during planting season, and expect productive harvest. 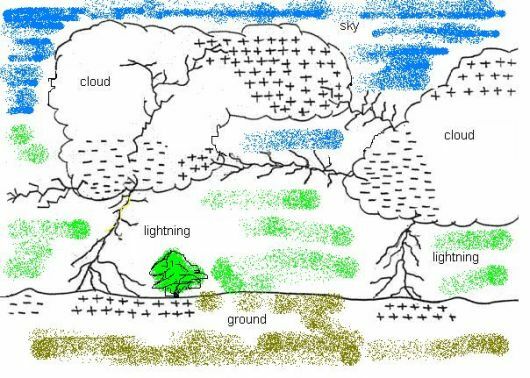 Did you know that lightning means more ionization of the atmosphere and cleaning of the air around? All living things, animals and plants grow healthier under such circumstances. All people and other living things are benefited from the lightning. In a deep forest, near the waterfall, dew drops from green leaves, especially in the morning or after rainfall. Do you feel great when you inhale it? This good effect is because of natural ionization of God's nature. After a heavy downfall of rain, thunder and lightning, in the middle of rice field or green pastured area, what do you feel? Fresh air and pleasant smell.healthy feeling. This is also caused by the ionization of the air due to lightning. Of course, such atmosphere can eradicate diseases of the world. Some antagonists say that this is a psychological effect. It is all right even if it is psychological effect that helps you. Many diseases we suffer are due to psychological origin, aren't they? I created small lightning machine that produce negative unseen lightning. It is the PYRO-ENERGEN. The wavelength of negative energy that create incurable diseases -and- invisible lights produced by lightning have similar wavelength. I came to know that this PYRO-ENERGEN must be the answer to heal the world diseases. PYRO-ENERGEN does not inject any current to human body. It is just like that of Van de Graaff generator. The high voltage produced by the PYRO-ENERGEN just surrounds the surface of our body. This is the reason that PYRO-ENERGEN has no side effects at all. Also, many asked me about Zapper, F-SCAN, Beck Protocol, and many other microcurrent inducers including various health Spa machines. They are all the same galvanic mechanism which was found in 1780 by Luigi Galvani. When two different metals (copper and zinc for example) were connected and then both touched to different parts of a nerve of a frog leg at the same time, they made the leg contract. These machines and its fundamental technology are applied the same way and there is nothing new in their theories. Alessandro Volta in 1800s and Nikola Tesla in 1900s found the use of electricity to animals for vitalizing and rejuvenating health. And many started to apply or induce man-made current to human body, especially during WWII to speed up the healing of wounds and other illnesses of soldiers regardless of its side effect like skin burns that may appear later. Whatever frequency, waveform, voltage, or amount of flowing current you change and term it as best, the explanation of all these medical technology are maybe wrong due to unknown side effects that may occur sooner or later. As I mentioned in the website, any amount of current that are induced to our body cell, may result in Joule effect which will burn small blood vessels and some good body cells may die. Of course some bacteria and virus may die but it's only momentarily. There's no one who ever tried to use negative static electricity for diseases caused by viruses and other diseases. It's because all medical scientists think that medicines and electrocurrents should go and strike directly to bacteria and viruses to eradicate them. But despite all of this, nobody knew or found the cause of virus, isn't it? The PYRO-ENERGEN is the answer and I, Junji Takano is the founder of them all. Good luck and enjoy the PYRO-ENERGEN atmosphere, too. You are in the deep mountain forest in your room. Get well and obtain good health. Stay younger and live longer. PYRO-ENERGEN helps slow down the aging process, too.